When we look back to the time before 1914, we find ourselves living in a world of events which would have been inconceivable before the war. We were even beginning to regard war between civilized nations as a fable, thinking that such an absurdity would become less and less possible on our rational, internationally organized world. And what came after the war was a veritable witches’ sabbath. Everywhere fantastic revolutions, violent alterations of the map, reversions in politics to medieval or even antique prototypes, totalitarian states that engulf their neighbours and outdo all previous theocracies in their absolutist claims, persecutions of Christians and Jews, wholesale political murder, and finally we have witnessed a light-hearted piratical raid on a peaceful, half-civilized people. With such goings on in the wide world it is not in the least surprising that there should be equally curious manifestations on a smaller scale in other spheres. In the realm of philosophy we shall have to wait some time before anyone is able to assess the kind of age we are living in. But in the sphere of religion we can see at once that some very significant things have been happening. We need feel no surprise that in Russia the colourful splendours of the Eastern Orthodox Church have been superseded by the Movement of the Godless — indeed, one breathed a sigh of relief oneself when one emerged from the haze of an Orthodox church with its multitude of lamps and entered an honest mosque, where the sublime and invisible omnipresence of God was not crowded out by a superfluity of sacred paraphernalia. Tasteless and pitiably unintelligent as it is, and however deplorable the low spiritual level of the “scientific” reaction, it was inevitable that nineteenth-century “scientific” enlightenment should one day dawn in Russia. But what is more than curious — indeed, piquant to a degree — is that an ancient god of storm and frenzy, the long quiescent Wotan, should awake, like an extinct volcano, to new activity, in a civilized country that had long been supposed to have outgrown the Middle Ages. We have seen him come to life in the German Youth Movement, and right at the beginning the blood of several sheep was shed in honour of his resurrection. Armed with rucksack and lute, blond youths, and sometimes girls as well, were to be seen as restless wanderers on every road from the North Cape to Sicily, faithful votaries of the roving god. Later, towards the end of the Weimar Republic, the wandering role was taken over by thousands of unemployed, who were to be met with everywhere on their aimless journeys. By 1933 they wandered no longer, butmarched in their hundreds of thousands. The Hitler movement literally brought the whole of Germany to its feet, from five-year-olds to veterans, and produced a spectacle of a nation migrating from one place to another. Wotan the wanderer was on the move. He could be seen, looking rather shamefaced, in the meeting-house of a sect of simple folk in North Germany, disguised as Christ sitting on a white horse. I do not know if these people were aware of Wotan’s ancient connection with the figures of Christ and Dionysus, but it is not very probable. The German youths who celebrated the solstice with sheep-sacrifices were not the first to hear the rustling in the primeval forest of the unconsciousness. They were anticipated by Nietzsche, Schuler, Stefan George, and Ludwig Klages. The literary tradition of the Rhineland and the country south of the Main has a classical stamp that cannot easily be got rid of; every interpretation of intoxication and exuberance is apt to be taken back to classical models, to Dionysus, to the puer aeternus and the cosmogonic Eros. No doubt it sounds better to academic ears to interpret these things as Dionysus, but Wotan might be a more correct interpretation. He is the god of storm and frenzy, the unleasher of passions and the lust of battle; moreover he is a superlative magician and artist in illusion who is versed in all secrets of an occult nature. A roaring wind tore the gates asunder; whistling, shrieking, and keening, it cast a black coffin before me. And amid the roaring and whistling and shrieking the coffin burst open and spouted a thousand peals of laughter. Are you not yourself the wind with shrill whistling, which bursts open the gates of the fortress of death? Are you not yourself the coffin filled with life’s gay malice and angel-grimaces? This remarkable image of the hunter-god is not a mere dithyrambic figure of speech but is based on an experience which Nietzsche had when he was fifteen years old, at Pforta. It is described in a book by Nietzsche’s sister, Elizabeth Foerster-Nietzsche. As he was wandering about in a gloomy wood at night, he was terrified by a “blood-curdling shriek from a neighbouring lunatic asylum,” and soon afterwards he came face to face with a huntsman whose “features were wild and uncanny.” Setting his whistle to his lips “in a valley surrounded by wild scrub,” the huntsman “blew such a shrill blast” that Nietzsche lost consciousness– but woke up again in Pforta. It was a nightmare. It is significant that in his dream Nietzsche, who in reality intended to go to Eisleben, Luther’s town, discussed with the huntsman the question of going instead to”Teutschenthal” (Valley of the Germans). No one with ears can misunderstand the shrill whistling of the storm-god in the nocturnal wood. In his Reich ohne Raum, which was first published in 1919, Bruno Goetz saw the secret of coming events in Germany in the form of a very strange vision. I have never forgotten this little book, for it struck meat the time as a forecast of the German weather. It anticipates the conflict between the realm of ideas and life, between Wotan’s dual nature as a god of storm and a god of secret musings. Wotan disappeared when his oaks fell and appeared again when the Christian God proved too weak to save Christendom from fratricidal slaughter. When the Holy Father at Rome could only impotently lament before God the fate of the grex segregatus, the one-eyed old hunter, on the edge of the German forest, laughed and saddled Sleipnir. We are always convinced that the modern world is a reasonable world, basing our opinion on economic, political, and psychological factors. But if we may forget for a moment that we are living in the year of Our Lord 1936, and, laying aside our well-meaning, all-too-human reasonableness, may burden God or the gods with the responsibility for contemporary events instead of man, we would find Wotan quite suitable as a casual hypothesis. In fact, I venture the heretical suggestion that the unfathomable depths of Wotan’s character explain more of National Socialism than all three reasonable factors put together. There is no doubt that each of these factors explains an important aspect of what is going on in Germany, but Wotan explains yet more. He is particularly enlightening in regard to a general phenomenon which is so strange to anybody not a German that it remains incomprehensible, even after the deepest reflection. A mind that is still childish thinks of the gods as metaphysical entities existing in their own right, or else regards them as playful or superstitious inventions. From either point of view the parallel between Wotan redivivus and the social, political and psychic storm that is shaking Germany might have at least the value of a parable. But since the gods are without doubt personifications of psychic forces, to assert their metaphysical existence is as much an intellectual presumption as the opinion that they could ever be invented. Not that “psychic forces” have anything to do with the conscious mind, fond as we are of playing with the idea that consciousness and psyche are identical. This is only another piece of intellectual presumption. “Psychic forces” have far more to do with the realm of the unconscious. Our mania for rational explanations obviously has its roots in our fear of metaphysics, for the two were always hostile brothers. Hence, anything unexpected that approaches us from the dark realm is regarded either as coming from outside and, therefore, as real, or else as an hallucination and, therefore, not true. The idea that anything could be real or true which does not come from outside has hardly begun to dawn on contemporary man. For the sake of better understanding and to avoid prejudice, we could of course dispense with the name “Wotan” and speak instead of the Furor Teutonicus. But we should only be saying the same thing and not as well, for the furor in this case is a mere psychologizing of Wotan and tells us no more than that the Germans are in a state of “fury.” We thus lose sight of the most peculiar feature of this whole phenomenon, namely, the dramatic aspect of the Ergreifer and the Ergriffener. The impressive thing about the German phenomenon is that one man, who is obviously “possessed,” has infected a whole nation to such an extent that everything is set in motion and has started rolling on its course towards perdition. It seems to me that Wotan hits the mark as an hypothesis. Apparently he really was only asleep in the Kyffhauser mountain until the ravens called him and announced the break of day. He is a fundamental attribute of the German psyche, an irrational psychic factor which acts on the high pressure of civilization like a cyclone and blows it away. Despite their crankiness, the Wotan-worshippers seem to have judged things more correctly than the worshippers of reason. Apparently everyone had forgotten that Wotan is a Germanic datum of first importance, the truest expression and unsurpassed personification of a fundamental quality that is particularly characteristic of the Germans. Houston Stewart Chamberlain is a symptom which arouses suspicion that other veiled gods may be sleeping elsewhere. The emphasis on the Germanic race — commonly called “Aryan” — the Germanic heritage, blood and soil, the Wagalaweia songs, the ride of the Valkyries, Jesus as a blond and blue-eyed hero, the Greek mother of St Paul, the devil as an international Alberich in Jewish or Masonic guise, the Nordic aurora borealis as the light of civilization, the inferior Mediterranean races — all this is the indispensable scenery for the drama that is taking place and at the bottom they all mean the same thing: a god has taken possession of the Germans and their house is filled with a “mighty rushing wind.” It was soon after Hitler seized power, if I am not mistaken, that a cartoon appeared in Punch of a raving berserker tearing himself free from his bonds. A hurricane has broken loose in Germany while we still believe it is fine weather. Things are comparatively quiet in Switzerland, though occasionally there is a puff of wind from the north or south. Sometimes it has a slightly ominous sound, sometimes it whispers so harmlessly or even idealistically that no one is alarmed. “Let the sleeping dogs lie” –we manage to get along pretty well with this proverbial wisdom. It is sometimes said that the Swiss are singularly averse to making a problem of themselves. I must rebut this accusation: the Swiss do have their problems, but they would not admit it for anything in the world, even though they see which way the wind is blowing. We thus pay our tribute to the time of storm and stress in Germany, but we never mention it, and this enables us to feel vastly superior. It is above all the Germans who have an opportunity, perhaps unique in history, to look into their own hearts and to learn what those perils of the soul were from which Christianity tried to rescue mankind. Germany is a land of spiritual catastrophes, where nature never makes more than a pretense of peace with the world-ruling reason. The disturber of the peace is a wind that blows into Europe from Asia’s vastness, sweeping in on a wide front from Thrace to the Baltic, scattering the nations before it like dry leaves. or inspiring thoughts that shake the world to its foundations. It is an elemental Dionysus breaking into the Apollonian order. The rouser of this tempest is named Wotan, and we can learn a good deal about him from the political confusion and spiritual upheaval he has caused throughout history. For a more exact investigation of his character, however, we must go back to the age of myths, which did not explain everything in terms of man and his limited capacities, but sought the deeper cause in the psyche and its autonomous powers. Man’s earliest intuitions personified these powers as gods, and described them in the myths with great care and circumstantiality according to their various characters. This could be done the more readily on account of the firmly established primordial types or images which are innate in the unconscious of many races and exercise a direct influence upon them. Because the behavior of a race takes on its specific character from its underlying images, we can speak of an archetype “Wotan.” As an autonomous psychic factor, Wotan produces effects in the collective life of a people and thereby reveals his own nature. For Wotan has a peculiar biology of his own, quite apart from the nature of man. It is only from time to time that individuals fall under the irresistible influence of this unconscious factor. When it is quiescent, one is no more aware of the archetype Wotan than of a latent epilepsy. Could the Germans who were adults in 1914 have foreseen what they would be today? Such amazing transformations are the effect of the god of wind, that “bloweth where it listeth, and thou hearest the sound thereof, but canst not tell whence it cometh, nor whither it goeth.” It seizes everything in its path and overthrows everything that is not firmly rooted. When the wind blows it shakes everything that is insecure, whether without or within. Martin Ninck has recently published a monograph which is a most welcome addition to our knowledge of Wotan’s nature. The reader need not fear that this book is nothing but a scientific study written with academic aloofness from the subject. Certainly the right to scientific objectivity is fully preserved, and the material has been collected with extraordinary thoroughness and presented in unusually clear form. But, over and above all this, one feels that the author is vitally interested in it, that the chord of Wotan is vibrating in him, too. This is no criticism — on the contrary, it is one of the chief merits of the book, which without this enthusiasm might easily have degenerated into a tedious catalogue. Ninck sketches a really magnificent portrait of the German archetype Wotan. He describes him in ten chapters, using all the available sources, as the berserker, the god of storm, the wanderer, the warrior, the Wunsch- and Minne-god, the lord of the dead and of the Einherjar, the master of secret knowledge, the magician, and the god of the poets. Neither the Valkyries nor the Fylgja are forgotten, for they form part of the mythological background and fateful significance of Wotan. Ninck’s inquiry into the name and its origin is particularly instructive. He shows that Wotan is not only a god of rage and frenzy who embodies the instinctual and emotion aspect of the unconscious. Its intuitive and inspiring side, also, manifests itself in him, for he understands the runes and can interpret fate. The Romans identified Wotan with Mercury, but his character does not really correspond to any Roman or Greek god, although there are certain resemblances. He is a wanderer like Mercury, for instance, he rules over the dead like Pluto and Kronos, and is connected with Dionysus by his emotional frenzy, particularly in its mantic aspect. It is surprising that Ninck does not mention Hermes, the god of revelation, who as pneuma and nous is associated with the wind. He would be the connecting-link with the Christian pneuma and the miracle of Pentecost. As Poimandres (the shepherd of men), Hermes is an Ergreifer like Wotan. Ninck rightly points out that Dionysus and the other Greek gods always remained under the supreme authority of Zeus, which indicates a fundamental difference between the Greek and the Germanic temperament. Ninck assumes an inner affinity between Wotan and Kronus, and the latter’s defeat may perhaps be a sign that the Wotan-archetype was once overcome and split up in prehistoric times. At all events, the Germanic god represents a totality on a very primitive level, a psychological condition in which man’s will was almost identical with the god’s and entirely at his mercy. But the Greeks had gods who helped man against other gods; indeed, All-Father Zeus himself is not far from the ideal of a benevolent, enlightened despot. It was not in Wotan’s nature to linger on and show signs of old age. He simply disappeared when the times turned against him, and remained invisible for more than a thousand years, working anonymously and indirectly. Archetypes are like riverbeds which dry up when the water deserts them, but which it can find again at any time. An archetype is like an old watercourse along which the water of life has flowed for centuries, digging a deep channel for itself. The longer it has flowed in this channel the more likely it is that sooner or later the water will return to its old bed. The life of the individual as a member of society and particularly as a part of the State maybe regulated like a canal, but the life of nations is a great rushing river which is utterly beyond human control, in the hands of One who has always been stronger than men. The League of Nations, which was supposed to possess supranational authority, is regarded by some as a child in need of care and protection, by others as an abortion. Thus, the life of nations rolls on unchecked, without guidance, unconscious of where it is going, like a rock crashing down the side of a hill, until it is stopped by an obstacle stronger than itself. Political events move from one impasse to the next, like a torrent caught in gullies, creeks and marshes. All human control comes to an end when the individual is caught in a mass movement. Then, the archetypes begin to function, as happens, also, in the lives of individuals when they are confronted with situations that cannot be dealt with in any of the familiar ways. But what a so-called Fuhrer does with a mass movement can plainly be seen if we turn our eyes to the north or south of our country. The ruling archetype does not remain the same forever, as is evident from the temporal limitations that have been set to the hoped-for reign of peace, the “thousand-year Reich.” The Mediterranean father-archetype of the just, order-loving, benevolent ruler had been shattered over the whole of northern Europe, as the present fate of the Christian Churches bears witness. Fascism in Italy and the civil war in Spain show that in the south as well the cataclysm has been far greater than one expected. Even the Catholic Church can no longer afford trials of strength. The nationalist God has attacked Christianity on abroad front. In Russia, he is called technology and science, in Italy, Duce, and in Germany, “German Faith,” “German Christianity,” or the State. The “German Christians” are a contradiction in terms and would do better to join Hauer’s “German Faith Movement.” These are decent and well-meaning people who honestly admit their Ergriffenheit and try to come to terms with this new and undeniable fact. They go to an enormous amount of trouble to make it look less alarming by dressing it up in a conciliatory historical garb and giving us consoling glimpses of great figures such as Meister Eckhart, who was, also, a German and, also, ergriffen. In this way the awkward question of who the Ergreifer is is circumvented. 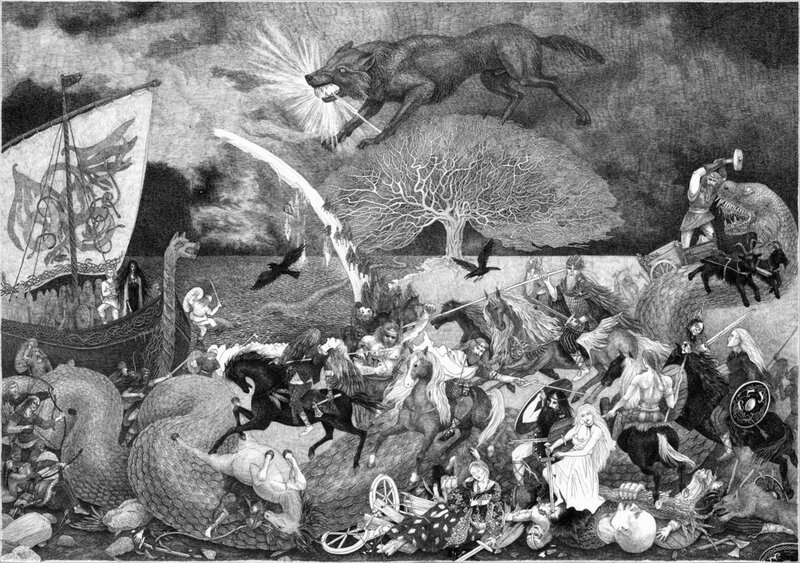 He was always”God.” But the more Hauer restricts the world-wide sphere of Indo-European culture to the “Nordic” in general and to the Edda in particular, and the more “German” this faith becomes as a manifestation of Ergriffenheit, the more painfully evident it is that the”German” god is the god of the Germans. One cannot read Hauer’s book without emotion, if one regards it as the tragic and really heroic effort of a conscientious scholar who, without knowing how it happened to him, was violently summoned by the inaudible voice of the Ergreifer and is now trying with all his might, and with all his knowledge and ability, to build a bridge between the dark forces of life and the shining world of historical ideas. But what do all the beauties of the past from totally different levels of culture mean to the man of today, when confronted with a living and unfathomable tribal god such as he has never experienced before? They are sucked like dry leaves into the roaring whirlwind, and the rhythmic alliterations of the Edda became inextricably mixed up with Christian mystical texts, German poetry and the wisdom of the Upanishads. Hauer himself is ergriffen by the depths of meaning in the primal words lying at the root of the Germanic languages, to an extent that he certainly never knew before. Hauer the Indologist is not to blame for this, nor yet the Edda; it is rather the fault of kairos — the present moment in time — whose name on closer investigation turns out to be Wotan. I would, therefore, advise the German Faith Movement to throw aside their scruples. Intelligent people who will not confuse them with the crude Wotan-worshippers whose faith is a mere pretense. There are people in the German Faith Movement who are intelligent enough not only to believe, but to know, that the god of the Germans is Wotan and not the Christian God. This is a tragic experience and no disgrace. It has always been terrible to fall into the hands of a living god. Yahweh was no exception to this rule, and the Philistines, Edomites, Amorites and the rest, who were outside the Yahweh experience, must certainly have found it exceedingly disagreeable. The Semitic experience of Allah was for a long time an extremely painful affair for the whole of Christendom. We who stand outside judge the Germans far too much, as if they were responsible agents, but perhaps it would be nearer the truth to regard them, also, as victims. EVENTS (London, 1947), 1-16; this version has been consulted. This entry was posted in Uncategorized on 12/15/2015 by Völkisch Pagan.